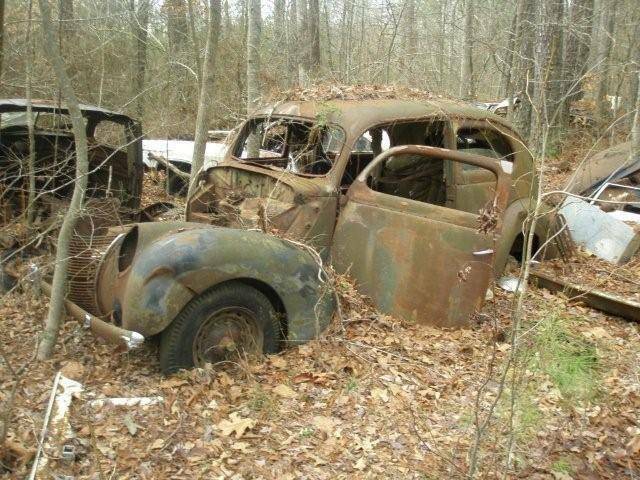 1940's Rusty Ride Photo Picture Classic Cars for sale & Classifieds - Buy Sell Classic Car & Classic Truck Classifieds. Any guesses on the year, make and model of this Rusty Ride sent in by Troy, an OldRide member. Definitely another '37; Grill and headlights tell all! 39-40 cant see Grille to tell if 3 piece 40. Brother had a 40 4dr. I wish I would have saved it,Dad sold it. i'd say 39 dlx.I can't see any rot,so haul er out&give er a home! 38 Deluxe or 39 Standard. I think the rims are 38. Sad to see it waste away. They don't get in better condition sitting in the woods. Late 1930s Ford, perhaps 39. Looks savable by someone with time and welding skill. Shot reminds me of cars in the woods I remember growing up in Massachusetts.